Stop by the third annual Pathways Summit for everything you need to know to hop on your pathway to success. 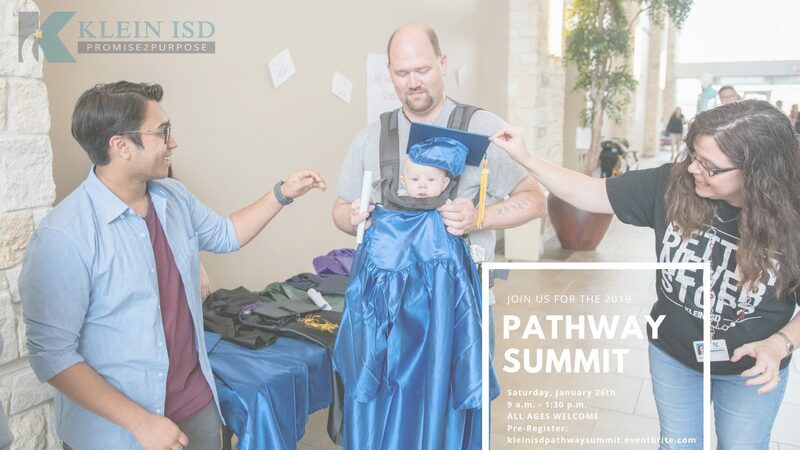 The Pathways Summit will take place on Saturday, January 26, at the Klein Multipurpose Center from 9:00 am -1:30 pm. Students (of all ages! ), parents and Klein ISD staff are invited to attend what promises to be an informative and innovative day of information designed to create equipped scholars and pathway explorers. Sessions including graduation endorsements overview session, graduation endorsement panelists sessions – including experts in each endorsement/career areas, existing and new accelerated college pathways, College Board, Dual Credit, PSAT/SAT, financial aid and scholarships, AVID, accelerated course options, 5th to 6th and 8th to 9th grade transition information, and Counselors (elementary – high school) to provide course selection guidance and student challenges will again be available for attendees. View the Pathway Summit Schedule below.